Aquatic designers specialize in turning ideas into reality. A.S.A. fiberglass construction products offer professional designers maximum flexibility for integrating high quality products into creative project designs for many reasons. We have a full line of fiberglass construction products that support many different aquatic projects. Fiberglass products can endure temperature extremes, making it suitable for all geographies. And, unlike concrete, fiberglass requires no painting and doesn’t crack under normal circumstances. Download our A.S.A. MFG Brochure PDF Here. We are able to customize ou r fiberglass products to meet your plan specifications. 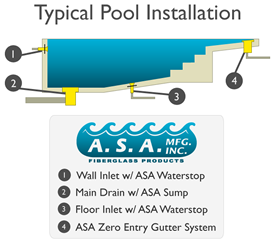 Outlet locations, optional ladders or valves can be added to our fiberglass designed products, per your drawings. Multiple styles of custom covers, latches and locks are available for our equipment covers and valve vaults. Many features, such as drains and gussets are integrated during the manufacturing process which are superior in strength and durability over competitive products of other composites or metals. 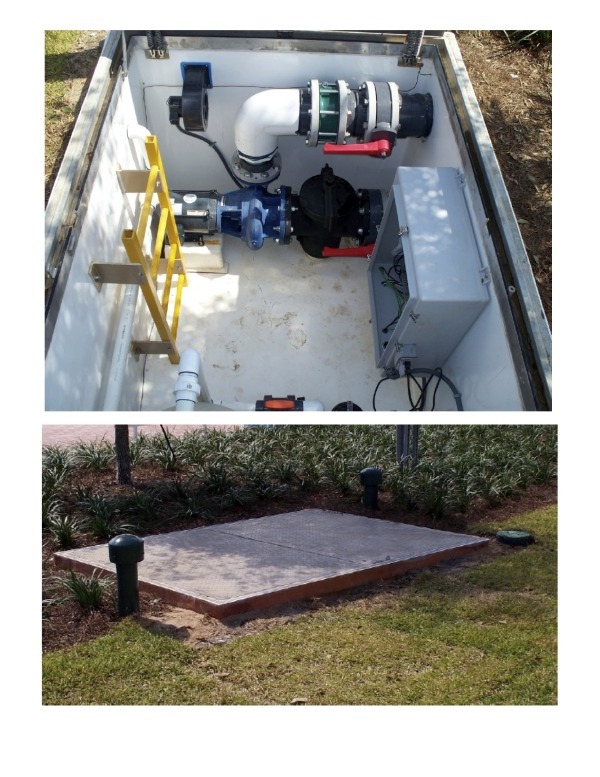 We have manufactured hundreds of collector tanks, sumps, gutters, valve vaults and equipment boxes. Our years of expertise allow us to easily customize high quality, heavy duty construction components that will be easy to install, have a long life and offer low maintenance for your customers. A.S.A. MFG. offers a full line of aquatic construction projects which can work together on a large project, allowing the designer to obtain specified products from one source and offering the builder and customer one stop shopping for related construction components. Our sumps and collector tanks fit the most common grate types and styles, offering the installer more flexibility at the job site and during installation. Our pre-fabricated fiberglass products offer a “drop in” modular solutions which provide easier and more exact installations over “forming & pouring”. The project specs are “built in” to our products! Sumps and collector tanks can be dropped into place at the job location and installation is completed in less time. We provide securing clips & sikaflex for grate covers, leveling plates for gutters, pre-drilled tie wire holes for waterstops and pre-fabricated, high quality hinged covers for equipment covers and valve vaults. All of these features reduce problems at the job site and speed up project completion. Our "Legacy" style fiberglass sumps are NSF certified, ASME A112.19.8a-2008 dimensionally compliant as an alternative to a field built sump / 2.3.4 Fig 2. These same sumps will fit most VGB grates. If you are looking to design a gravity flow system, we offer a line of pre-fabricated "drop in" ready I-bar sumps and fiberglass collector tanks with multiple lid and cover options. Need high capacity? We build fiberglass collector tanks which can hold over 2200 gallons. Equipment or valve vaults? Make them tamper free and protect pumps, filters and controllers. If you need stainless steel or fiberglass covers, ladder entry, integrated valves or a drain chase? We can build it. We offer fiberglass gutter systems which can accomodate zero entry or beach stylegutter designs, straight or custom radius solutions. Send us your drawings! A.S.A. MFG has been manufacturing fiberglass components for the aquatics industry for over 20 years. Our team of skilled fiberglass technicians have over 40 years of combined experience fabricating A.S.A. 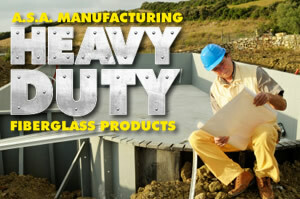 MFG branded sumps, tanks, gutters, walls and waterstops. We are proud to say that we make quality products which are built to last. Park owners appreciate the lasting durability of our products --we have a long list of satisfied customers and builders that can attest to the strength and quality of our products. 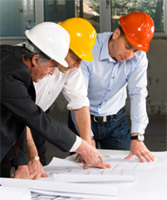 Call us or contact us today for project referrals and more information about using A.S.A. fiberglass construction components on your upcoming project.